Brilliant Lorraine. can tell you had fun doing it as it oozes fun, enjoyment and creativity. This is fantastic Lorraine, and I much prefer it to the bottle. Great fun Lorraine, you must of enjoyed playing lol. That's amazing, too, Lorrraine. 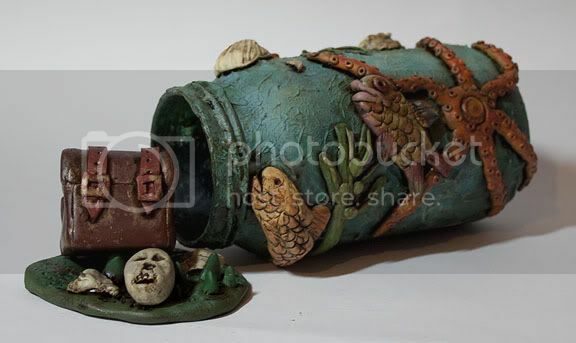 Whilst I might be able to replicate the actual bottle (with scrunched up tissue paper), I sure wouldn't be able to model the fish etc! Scatty wrote: Brilliant Lorraine. can tell you had fun doing it as it oozes fun, enjoyment and creativity. Oh totally agree - it's fabulous. What are the fish etc made from ? Is it a polymer clay ? Very effective. Glad you like it girls, 'cause I'm actually not very pleased with this one. All the stuff on the jar is Milliput. It's a modelling paste that air dries. The chest and other stuff is polymer clay. Bah, you're too self critical, If one of us had made it what would you say? It's not as stunning as the first bottle, but it's great in it's own right. Most of us would be hard pushed to manage anything remotely close to it, brilliant. This is super Lorraine and liking it more than the other one too.